It all started with a corn tortilla. Not just any corn tortilla. The Hot Bread Kitchen handmade corn tortillas lovingly pressed by hand and cooked over a hot comal. My friend Mark loves these tortillas, and tortillas in general. So when I saw them at the co-op last week I couldn’t resist picking up a package of six. (They sell these at the greenmarket in Union Square on Wednesdays too.) I figured they’d go well with all the black turtle beans in our cupboard, if nothing else. So finally this weekend Mark and I had the opportunity to cook together – we had previously soaked and cooked the black beans so that part was done. They were fragrant with bay leaves and garlic. Feeling ambitious, despite the late hour we were starting, we decided on enchiladas, rather than what would have been the quicker (but perhaps less gratifying) tacos with beans. 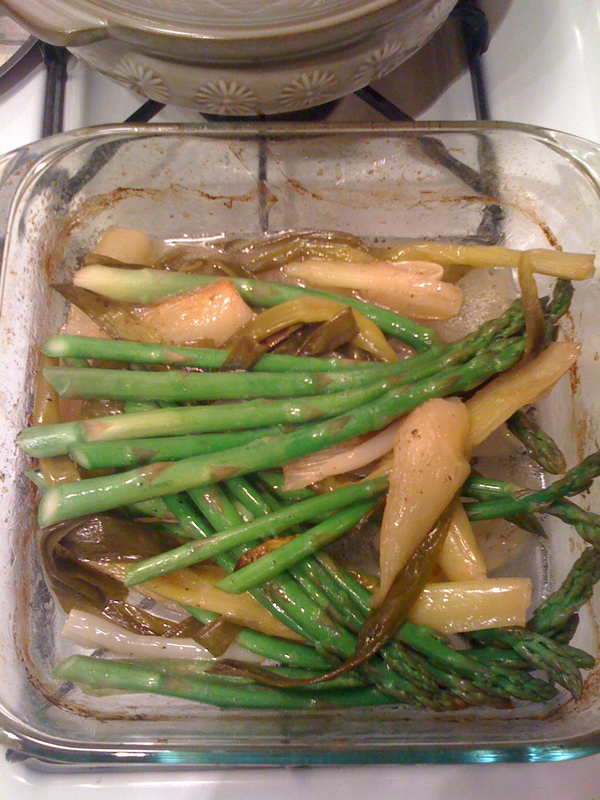 With spring onions and asparagus in the fridge from a recent greenmarket purchase, we decided on braising these in the oven as a side dish. The fridge and spice cupboard revealed the additional makings for the enchiladas; there was Carr Valley Bread Cheese from Murray’s Cheese (it’s a Finnish-style, mild, oven-baked cheese), and the true stars (and work horses) of this dish: Guajillo Chili Peppers from Penzeys Spices and Happy Quail Farms Pepper Chips from the San Francisco Bay Area, transported to Brooklyn on Mark’s carry-on recently. 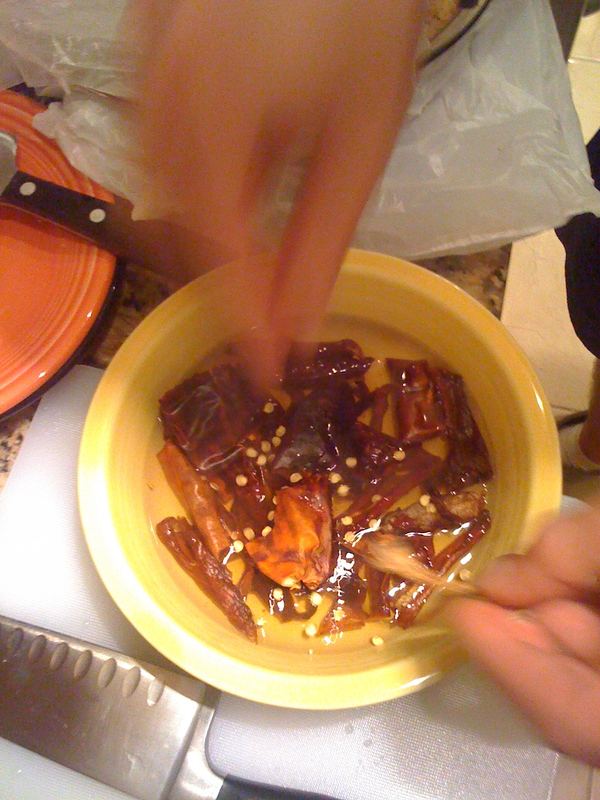 The first thing we had to do was soak the peppers in a hot water bath – this becomes the basis for the spicy enchilada sauce. 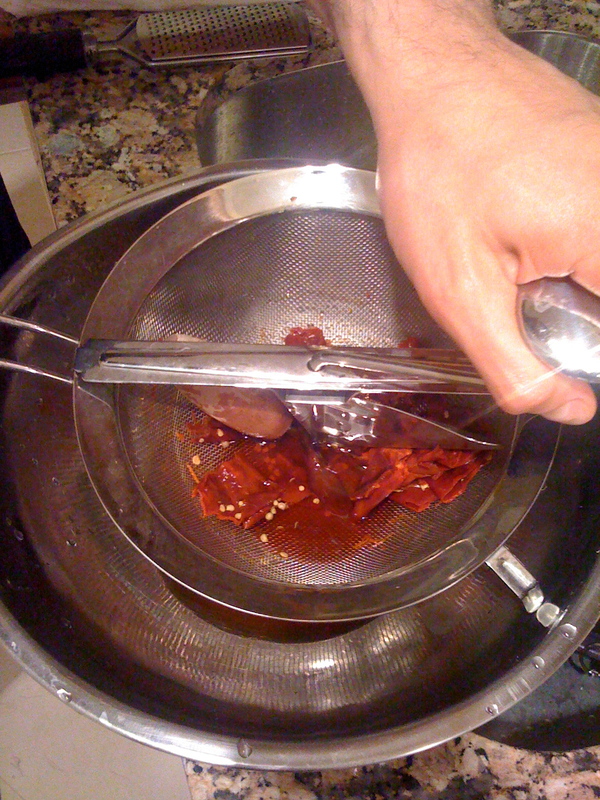 We boiled 1-2 cups of water in the kettle then poured it over the peppers in a bowl, and let soak for 20 minutes. As these were soaking I added the onions to a cold water bath to thoroughly clean these sandy alliums for our vegetable side dish. I changed the water once or twice to make sure they were free of all grit then patted dry. I pre-heated the oven to 400 degrees and into a glass casserole dish went 3 tbsp unsalted butter, 1/2 c white wine, and the onions (with green tops and all). Mark grated some fresh nutmeg over the onions, and added salt and lots of freshly ground black pepper. Then into the oven, uncovered, for 20-25 minutes. I washed the asparagus stalks (about 1/2 pound) and set aside (these guys will get steamed and later added to the onion dish). 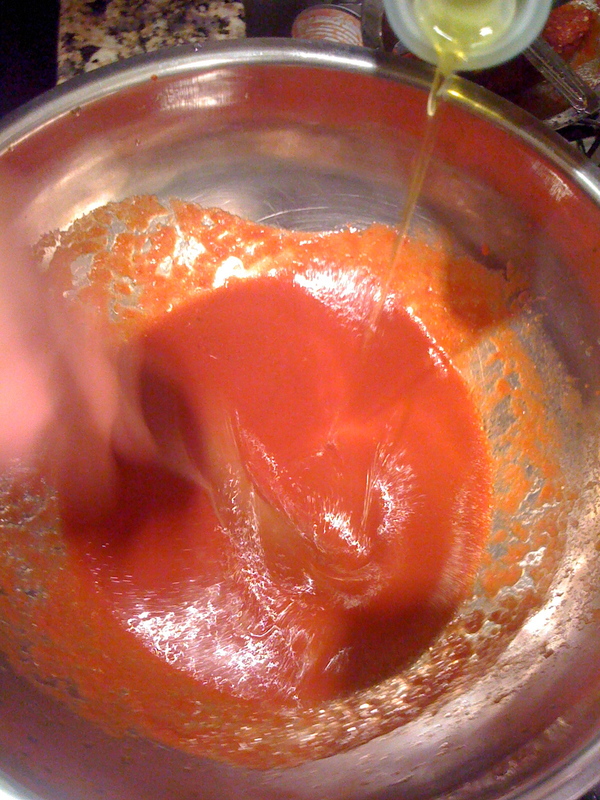 When there really was little life left to squeeze out of the peppers we added an 8-ounce can of tomato sauce – this thickens the overall sauce, adding more body and, crucially, tempers the heat. 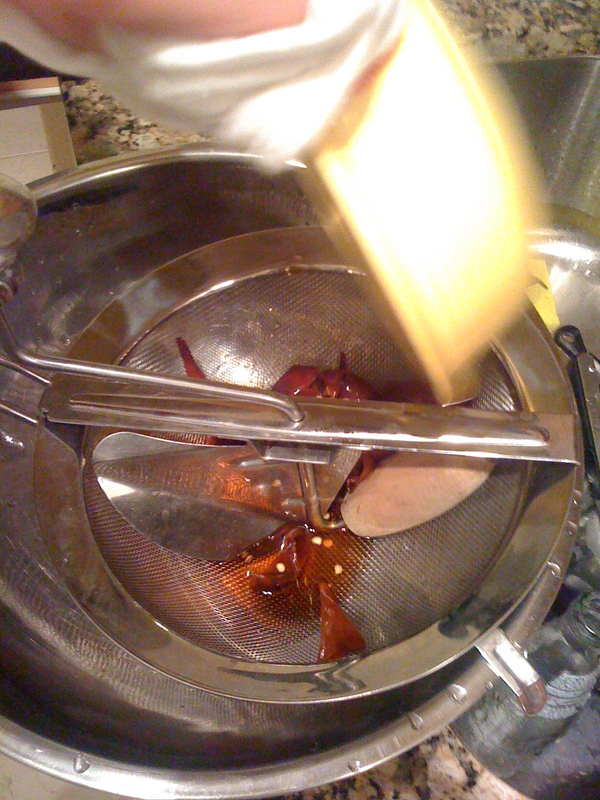 We also then slowly added somewhere between 4-5 tbsp of olive oil. At this point it was time to remove the braised onions from the oven and steam the asparagus on the stovetop for five minutes. 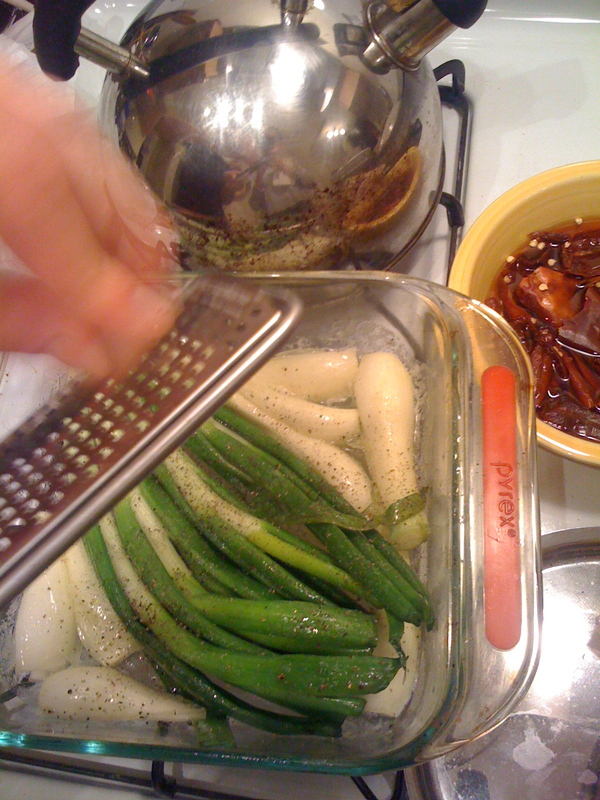 We added the asparagus to the baking dish and mixed it with the lovely juices of the braising liquid and onions. Keep warm, set aside. 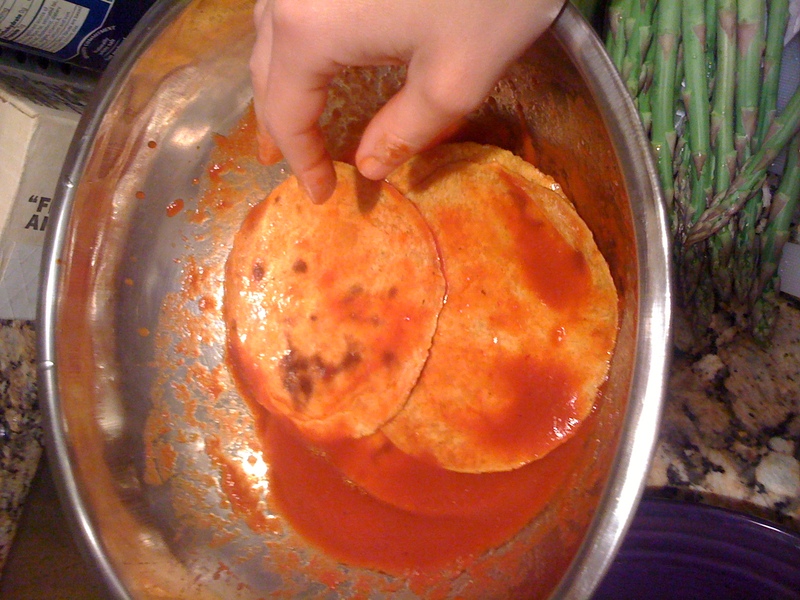 It was almost time to soak the tortillas in the sauce – but the sauce was still fiery hot so we added about 2 tbsp honey to smooth out the flavor. It still packed a lot of heat but not unbearably so. 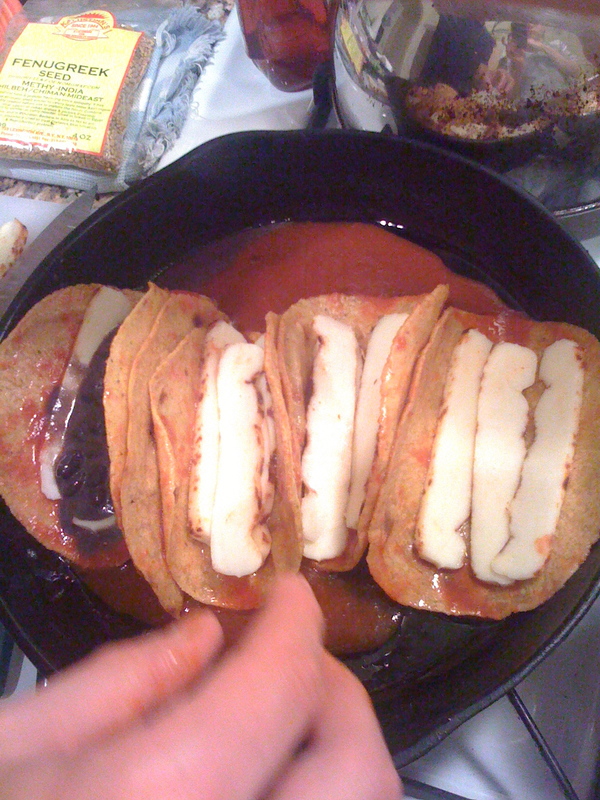 Then we added the tortillas to the sauce to soak them and make the tortillas more pliable (you wouldn’t want to soak as long with fresh or homemade tortillas, but these HBK ones come refrigerated so they’re not quite malleable) and absorb the flavors. We couldn’t get them soft enough to roll up entirely, so we decided to leave them in the shape of a taco, half-folded. 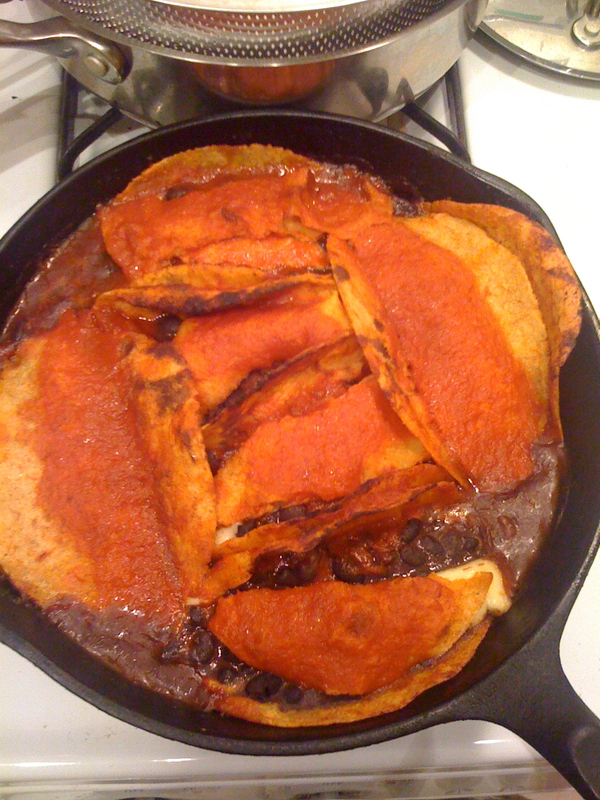 We coated the bottom of a cast-iron skillet (it was either a 10- or 12-inch pan) with a bit of the sauce then folded each tortilla and placed in the skillet. To each tortilla we added slices of the cheese then the black beans. We topped the whole dish off with the remaining fiery sauce before putting into the still-hot 400-degree oven for 15-20 minutes. When I checked on the enchiladas the tortillas had turned a crispy brown and the beans were bubbling along with the melted, creamy cheese. When ready to serve we squeezed fresh lime over the enchiladas and dove in. Served with the spring onion-asparagus dish we had ourselves a mouthwatering, eye-watering, good meal. It was topped off by a dessert of Mark’s homemade strawberry shortcake, a cool finish to the evening somewhere ’round midnight. November 8, 2011 Yum! I’m ttloaly on board with enchilada’s! They are so delicious!Ashley @ Good Taste Healthy Me recently posted..